Did you know both the Skipper 10’ and Skipper 11’ tenders fit on the davit, crane or swim platforms of many yachts starting at 42-feet? The most commonly used tender size is 10’ for most smaller yachts. 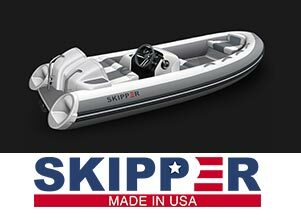 The Skipper 10’ fits the smaller yacht size specifications nicely. However, every yacht is different, and Tender Care Boats will need to consult with you to determine if your vessel is the right size. As you know, tenders are usually fitted in one of three places on a yacht (on the swim platform, deck or in the garage). Depending on which location is best for you, we can ensure the Skipper 10’ or Skipper 11’ are perfectly nestled in the right place to make sure your yachting experience is the best possible. Based on a Yachting Magazine article titled “Choose the Right Tender,” some yacht owners are misinformed when they are looking to purchase a tender. In an effort to get answers, Yachting Magazine interviewed Tender Care Boats owner Skip Reisert. Here’s what Skip had to say. If you are in the market for a yacht tender, contact Skip Reisert at Tender Care Boats to get some great advice on what tenders will fit your yacht. There are many key components that only an expert will be able to identify and save you lots of time and struggles as you go through the purchase process. Tender Care Boats has been servicing the marine industry for over 40 years. Come see our fine display of inflatable yacht tenders at our Fort Lauderdale showroom. Contact Skip to inquire about your sales or service needs.